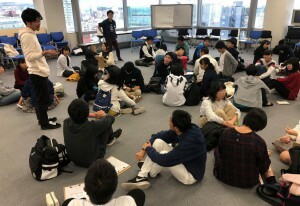 A practical workshop for high school students was led by Mr. Masato Ikeda, Senior Director of CSR Division, Human Resources & General Affairs Unit of SoftBank Corp., Executive Board Member of the Great East Japan Earthquake Recovery Initiatives Foundation. The workshop provided the high school students, who gathered together for the first time in almost two months, an opportunity to review the action plans they developed during their travel to the United States. Through various games and team discussion, the students learned a variety of specific approaches for implementing a project, such as key points of attention, the importance of involving adults, and the actual execution of projects. It was a valuable opportunity for the students who faced unexpected challenges in adjusting or implementing their action plans, but finally found solutions through the workshop. Mr. Sorachi Ojima, who participated from Sendai, Miyagi Prefecture, was not sure if his action plan worked well for his community after attempting to execute it. However, he is now determined to proceed after reviewing his plan again and applying what he leaned at the workshop. Additionally, Ms. Senna Abe, who participated from Koriyama, Fukushima Prefecture, developed an action plan to implement a tour of temples and shrines in her community to collect shuin, the red-seal stamps of those temples and shrines. After returning from the U.S. trip, she called seven temples and shrines in her community; however, only two temples agreed to support her idea. At the workshop, she enthusiastically shared that she learned how to write a proposal, which resulted in her realizing that she could have prepared a project proposal before asking the cooperation of the temples and shrines. The workshop provided the high school students with the opportunity to reflect on their U.S. trip and learn new practical methods for regional community contribution. The students have now taken another step in their journey to bring positive change to the Tohoku region. The Final Presentation is scheduled to be held in March of next year.